Architectural landscape lighting provides more than just safety and visibility around your home. With many LED outdoor lighting options available, your home could become the star of the neighborhood– along with extending your living space to your beautiful outdoor areas. There are lighting design options for every personality and lifestyle. Using spotlights to uplight architectural features of your home, special elements of your landscaping or treasured outdoor artwork provides a dramatic, stunning effect after dark. This glamorous style creates attention-grabbing shadow effects and can transform your home and outdoor living spaces. For a more natural aesthetic, we place lights in your trees to shine down with a softer “moonlighting” effect. The shadows from tree limbs has a very interesting appeal. Since we are accustomed to light sources like the sun and moon coming from above, this approach is more subdued. 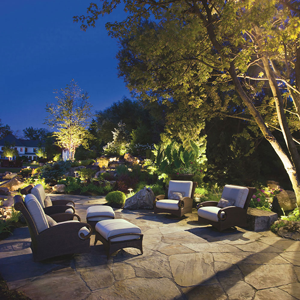 Outdoor hosts enjoy LED hardscape lighting. This lighting option provides ambient mood lighting that truly creates a party atmosphere– while still giving you enough light to cook in your outdoor pizza oven. No matter which lighting style you prefer, LED landscape lighting is hassle-free and affordable to maintain. 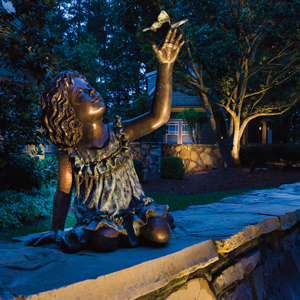 Call Sean at TriState Water Works to discuss your landscape lighting dream.